A splendid apartment for two in central Haworth. Beautifully furnished, this self-catering accommodation would make a wonderful base for a holiday in Bronte Country for a couple. Weekly rates vary from £279 to £510 per week, dpending on time of year. This Haworth apartment is equipped for a faboulous romantic break in Haworth. 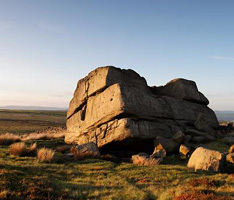 There would be no better way to explore the Bronte heritage and have a memorable holiday. The accommodation consists of a double bedroom, a bathroom with a double ended bath, an attractive living room made cosier by a woodburning stove. There is WiFi and a well-equipped kitchen.